FIFA president Gianni Infantino has given his whole hearted backing to the controversial video assistant referee technology. VAR, as it is known, has been trialled since the start of this season in Serie A and the Bundesliga, and will be introduced to Spanish La Liga next season. The system, criticised by some fans for slowing a game down, can only be used for key incidents in matches regarding goals, penalty decisions, straight red card decisions and cases of mistaken identity. The technology’s use in those leagues is part of the tests being carried out by the International Football Association Board (IFAB). “The results so far have been very encouraging, very positive,” Infantino told a sports conference in Dubai. 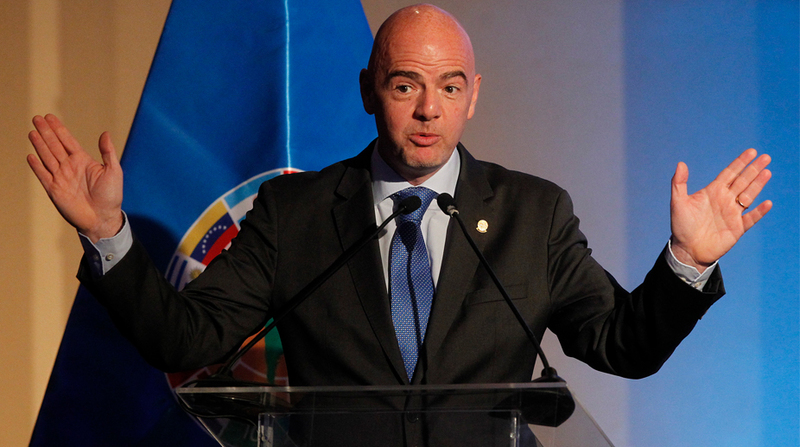 Despite his support, Infantino said football’s rulers had been right to take their time over introducing such a radical new ingredient to the game. “We have to protect the game and we have to invest in the protection of the game. “For this reason, before we change anything on the laws of the game, we have to be very careful, and we have to think about it not only once or twice or three times, but hundreds of times. “Nevertheless, I believe it was the right decision we took one and a half years ago to test the VAR’. He said it wasn’t “correct or fair” that in some cases the referee was the only one unaware he had made a wrong decision “because we prohibited him from knowing”. FIFA have yet to confirm whether the VAR will be used at next year’s World Cup in Russia.